Swarovski Optik presents the Z5 - a superior sighting system with outstanding optics and mechanics - and it's neatly configured into a trim 1.0" main-tube. With its spectacular field of view, crisp edge-to-edge sharpness, and rugged field-ready construction - The Z5 is well suited for everyday hunting and world-class safaris. 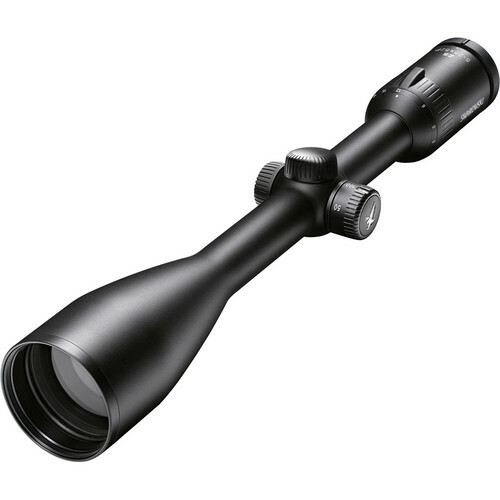 The Z5 5-25x52 pushes the envelope - it delivers a broad magnification range, yet it's relatively light, compact, and of course - reliable. The entire scope is fully water and fogproof thanks to a meticulous nitrogen-purging process. The low-profile turrets offer ¼ MOA click-stop corrections, and the rectangular adjustment range provides a very respectable 43 MOA of elevation correction. The lenses have been fully multicoated to optimize light transmission, and the external lens surfaces have been treated with a scratch-resistant SWARODUR protective coating. This Z5 is configured with a rugged 1.0" aluminum-alloy main-tube, side focus parallax correction, a matte black finish, and a Plex reticle in the second focal plane. Plex reticle: four long medium weight tapered posts. The posts stand out well against dark backgrounds while fine cross hairs establish your exact point of aim. The narrow gate of this reticle isolates your point of aim quickly to ensure rapid target acquisition. Second focal plane positioning of the reticle maintains the reticle's size across the magnification range. Box Dimensions (LxWxH) 17.0 x 4.5 x 4.0"